This years meeting with Mido went very well. With a great range of new products from dress to sport, the new offerings were impressive, to say the least. 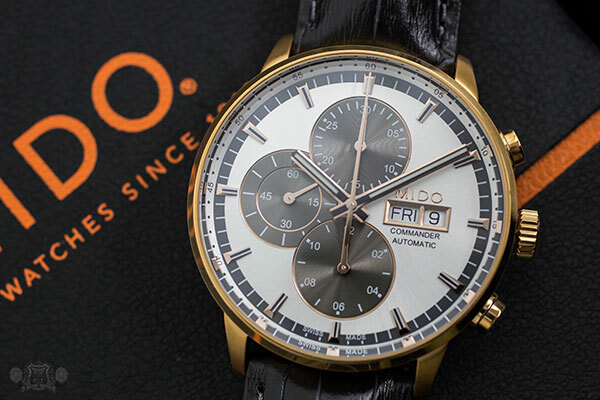 While still maintaining a humble price point, Mido has introduced more of the great quality pieces their fans love. 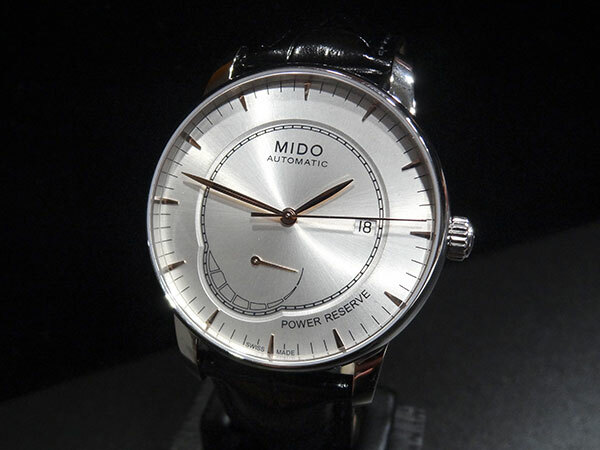 After being debuted at the Basel Fair of March 2012, the new Mido Multifort Power Reserve PVD M005.424.36.052.22 has finally delivered from Switzerland and is another great addition to the Multifort line up. With the tremendous success of the Mido Multifort Special Edition PVD, Mido decided to introduce a new variation with a new movement, and entirely different look. 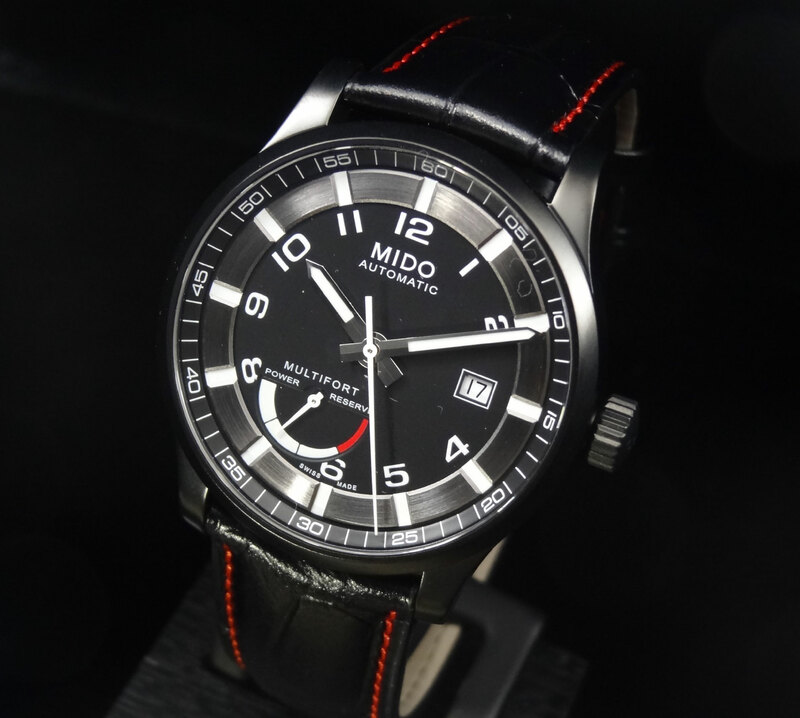 This latest rendition of Multifort is a similar dial deign to the M005.430.11.052.00 (which was released last year), yet has a PVD coating, an XL black leather strap with red stitching, and the obvious power reserve indicator at the 7 o’clock. The PVD case is 42mm wide and 10.6mm thick, making for a nice mid plus sized piece. The center dial and chapter ring are a matte black while there is a brushed steel (almost gunmetal in color) ring that has recessed index markers. Under those indexes are Arabic numerals which really contribute to its uncommon design. 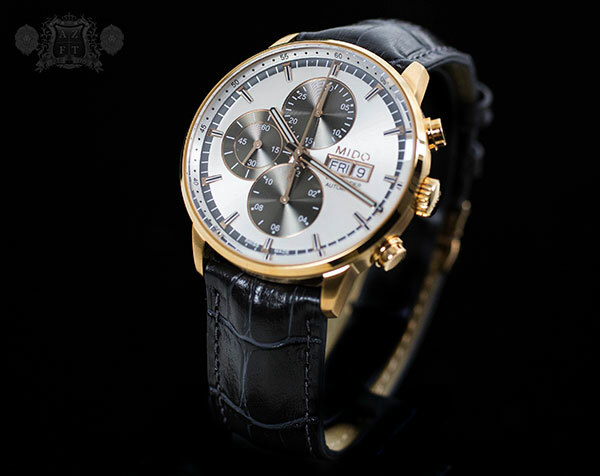 Protecting its unique dial is an anti-reflective sapphire crystal. The black leather croco-calf strap is really nicely done in a semi-gloss with red stitching that gives it a sporty look. 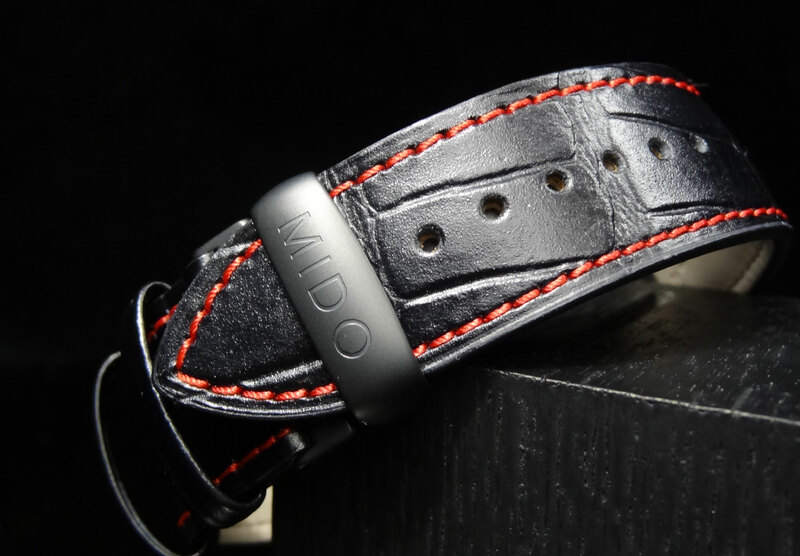 The strap has a pull apart deployment clasp that is also coated in PVD and bears the Mido logo. It’s amazing how something as small as the stitching on a band can really effect the character of a watch, and on this piece, it makes for a great compliment to an already impressive piece. 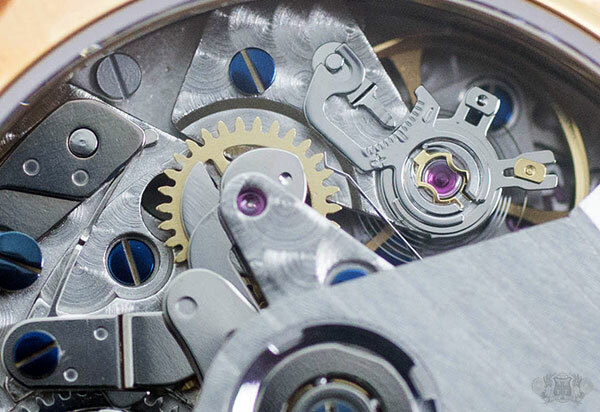 The movement is an ETA 2897, highly decorated and beautifully done with Geneva striping, perlage and blue screws. 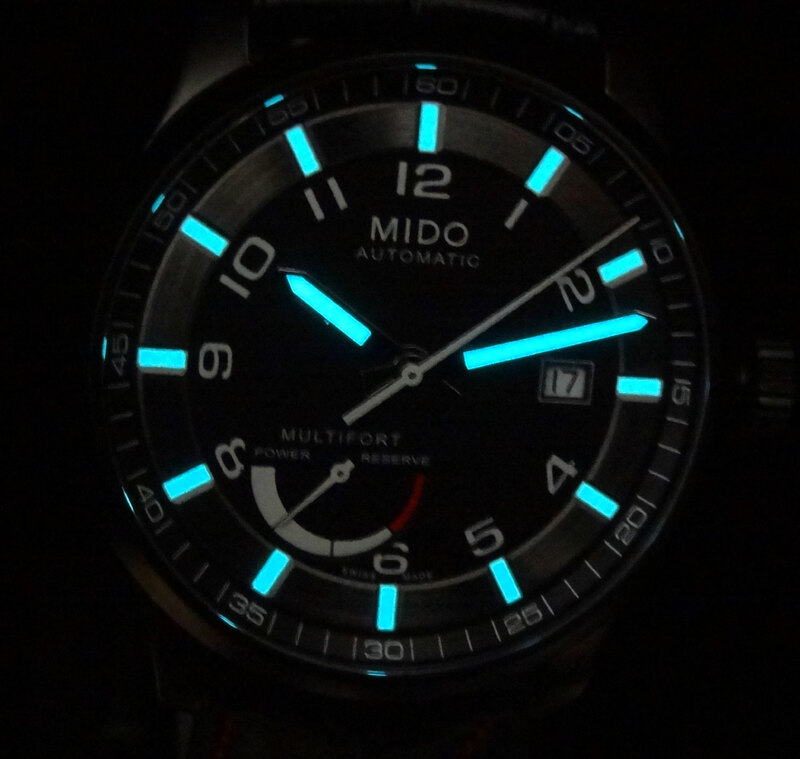 The finishing that Mido has for the money is incredible and by far a huge value compared to anything similar. The ETA 2897 is a workhorse movement that has 21 jewels, 28,800 bph, and shows hours minutes and seconds with date and power reserve display. 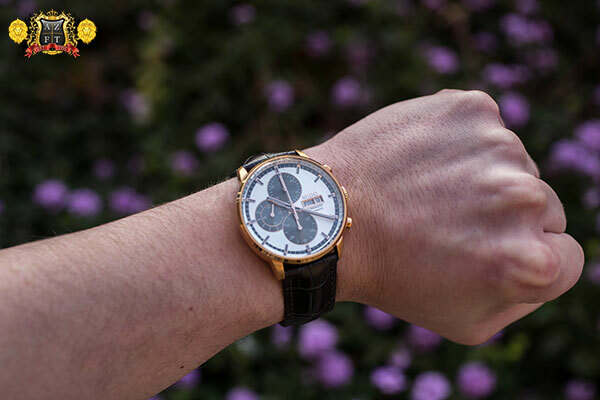 I can easily say that any 2890 variation movement is great to have and can be found in a wide variety of watches that are a much higher price point. Luckily, Mido keeps them very reasonable. 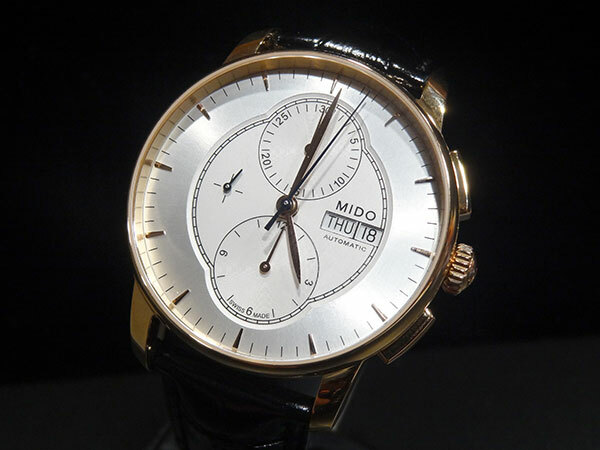 The retail price on the Mido Multifort Power Reserve PVD M005.424.36.052.22 is $1,690. This is practically unheard of for any 2897. 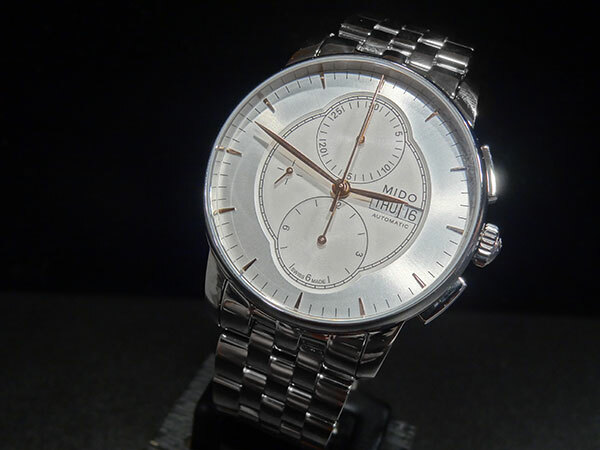 Mido is a true value brand that is hard to beat and we are proud to have them here at AZ Fine Time. If you have any questions, please feel free to call us at 1-800-486-3996. 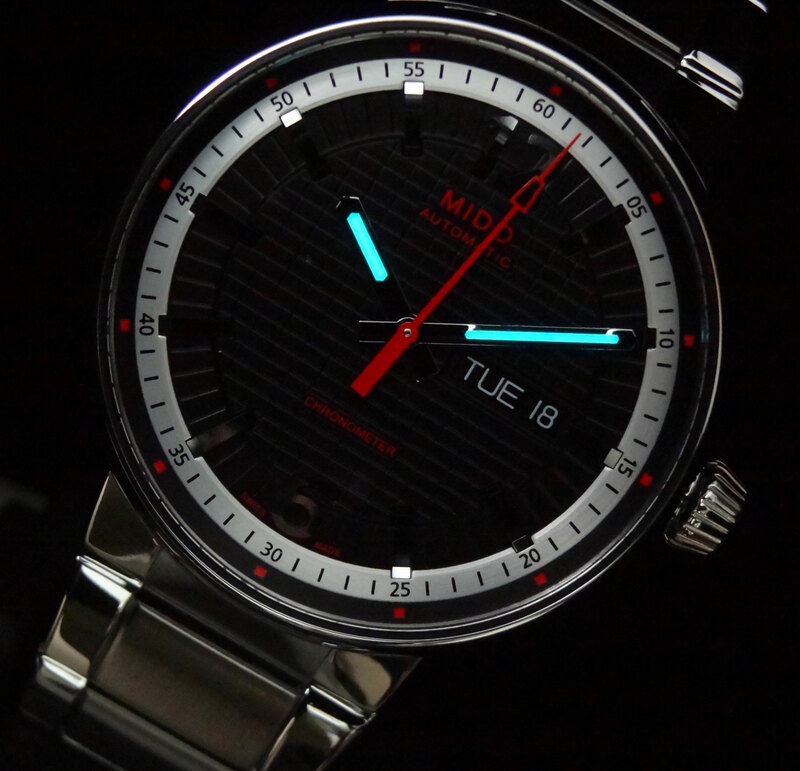 Mido is a brand that is often confused with being an Asian brand due to the name. The name is actually Spanish, meaning “to measure”. 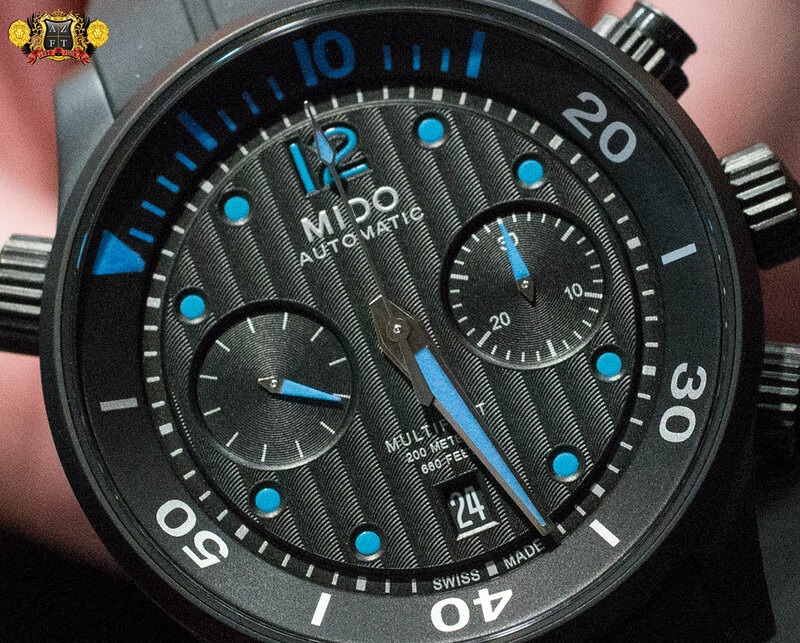 This confusion could actually make much more sense after the release of their latest model, the Mido Great Wall Chronometer 42mm M015.631.11.057.00. 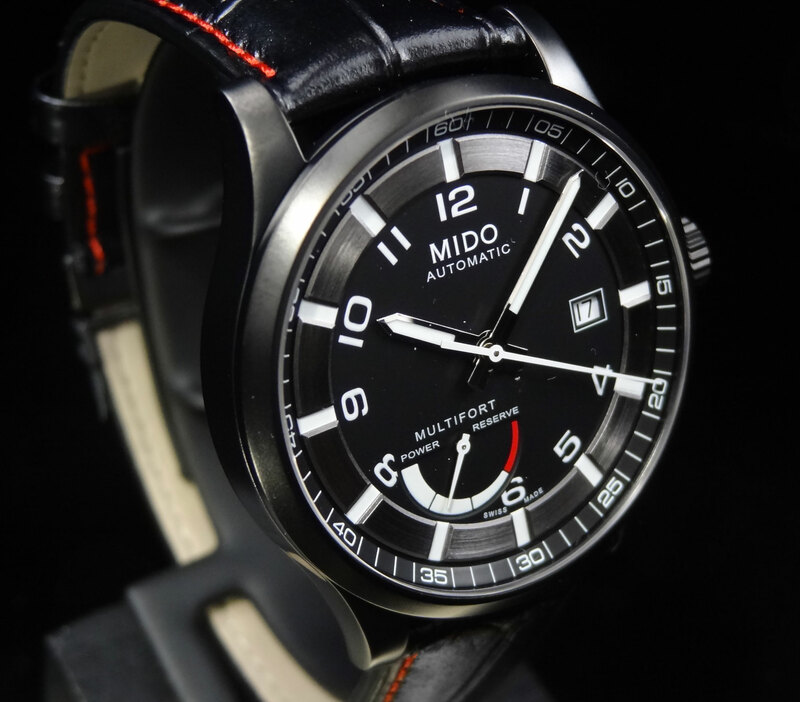 The Mido Great Wall was inspired by one of Mido’s leading markets most famous landmarks, the Great Wall of China. 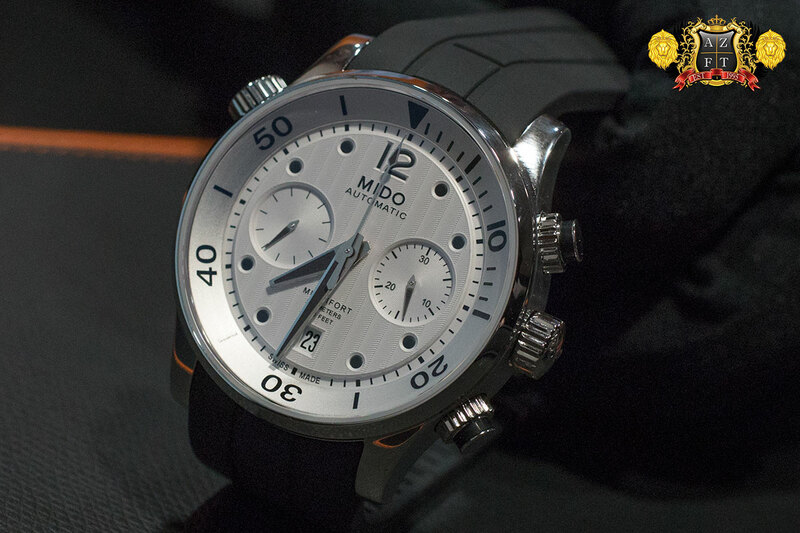 Mido has gained a tremendous following in China, with almost 700 boutiques carrying the Mido brand. 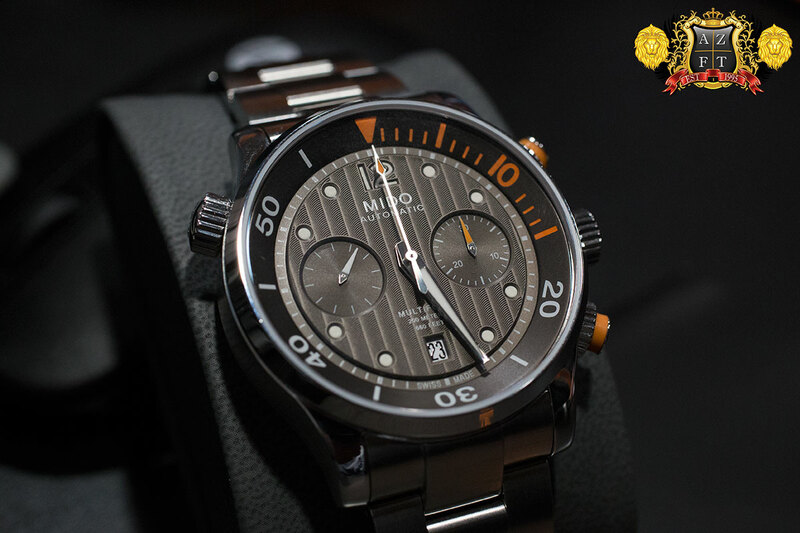 The sales numbers for Mido in China are unheard of, and as tribute to one of their largest markets, they have introduced the Mido Great Wall. 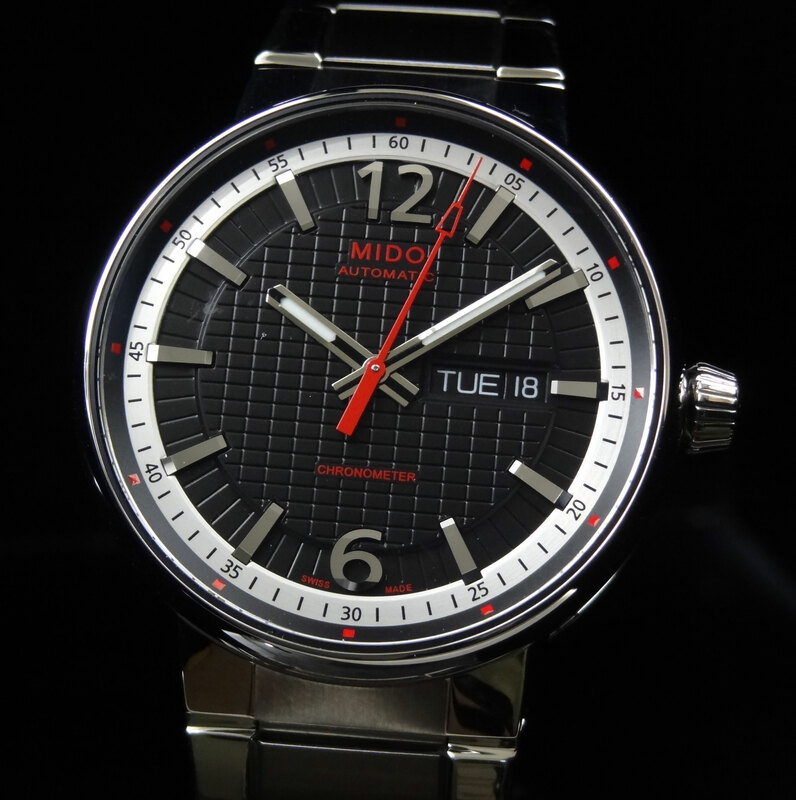 As with many of Mido’s watches, this architectural inspiration has influenced the design of this model, utilizing the brick type look both on the dial and case sides, and bracelet. This variation of the Great Wall is 42mm. 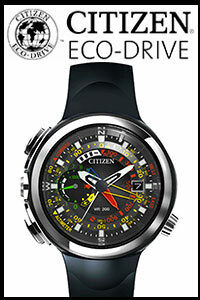 It is also available in a 39mm an a ladies 31mm. The case thickness on the 42mm is 11.5mm and the watch weighs in at 162.5g’s. The case design on this piece is very detailed. The columned (or bricked) case sides easily make it look worth 3 times the actual retail price. The thin high polished bezel is also very nice , giving a lot of dial space and making the appearance seem slightly larger than a 42mm. 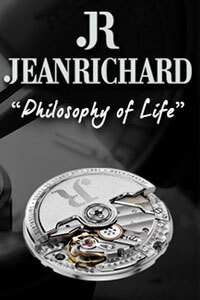 The dial itself is very complex using a black inner bezel, white chapter ring and black “bricked” center of the dial. 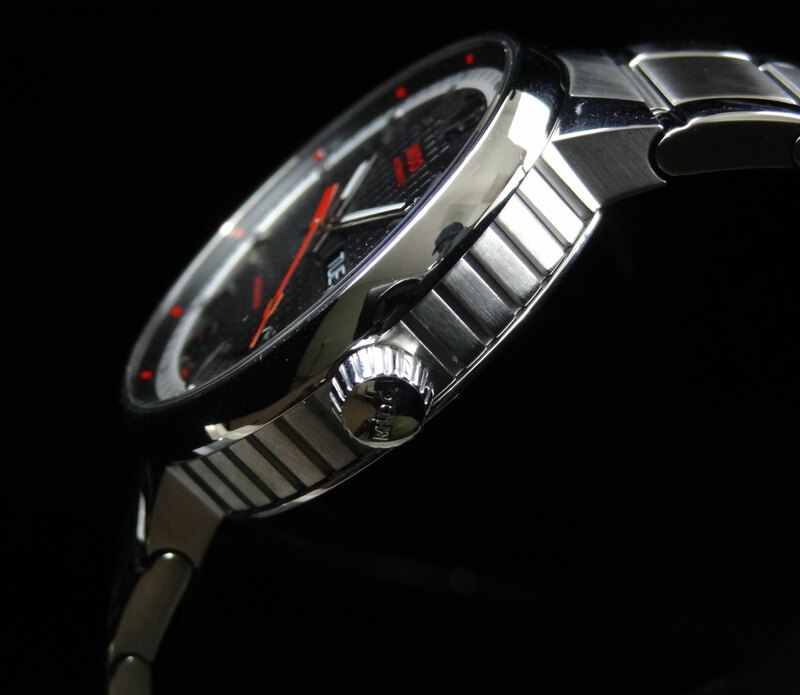 The red accents make the face really “pop” and add even more character to the already detailed dial. 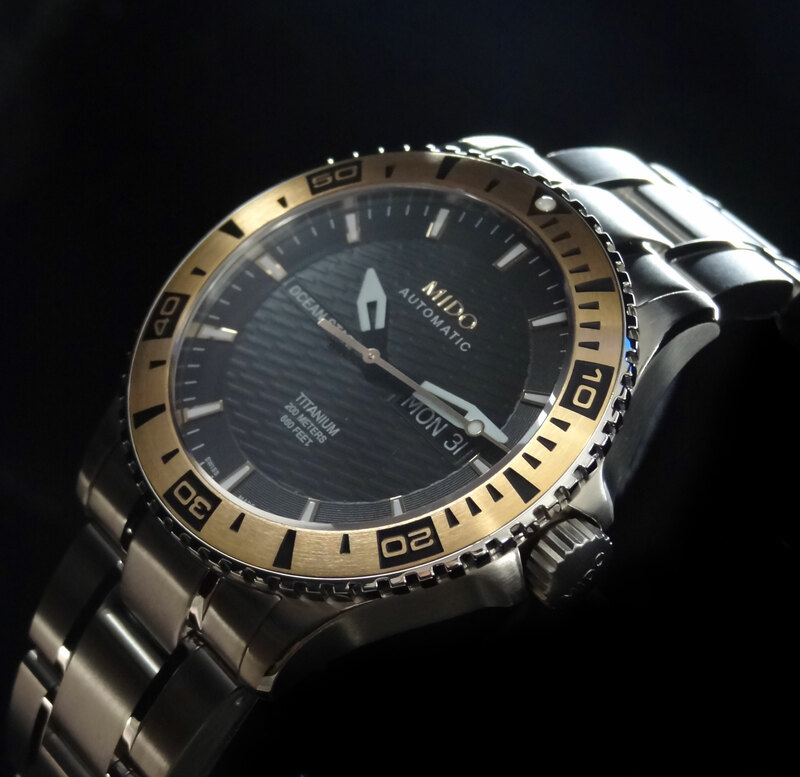 The dial is protected by a anti-reflective coated sapphire crystal. The bracelet on this model also continues with the brick theme being very square in design. 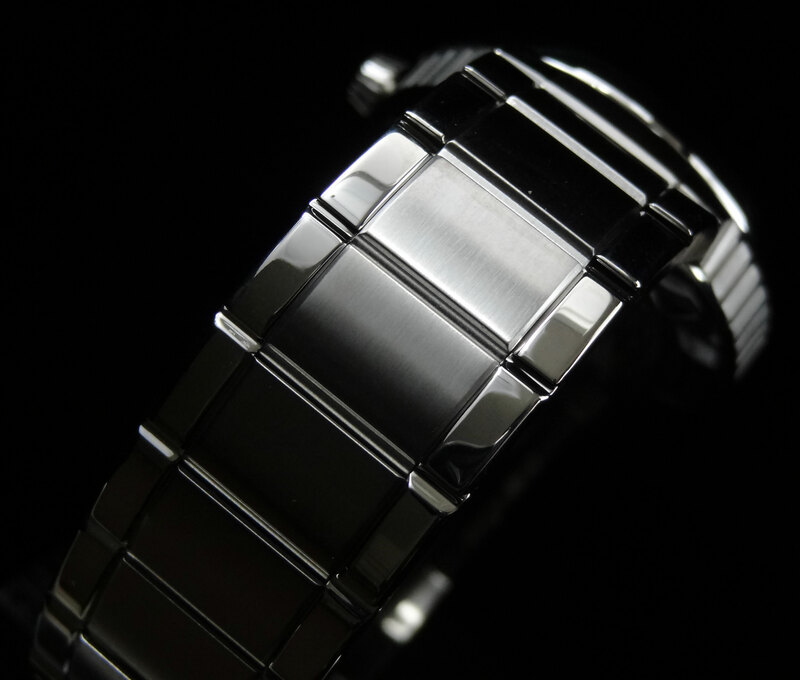 There is a very nice combination of brushed and high polished finish, giving the watch the detail it truly deserves. The bracelet is equipped with a butterfly deployment clasp to make for an easy, quick release. Everything about this watch flows together nicely and has really impressed myself, as well the rest of the staff here at AZ Fine Time. 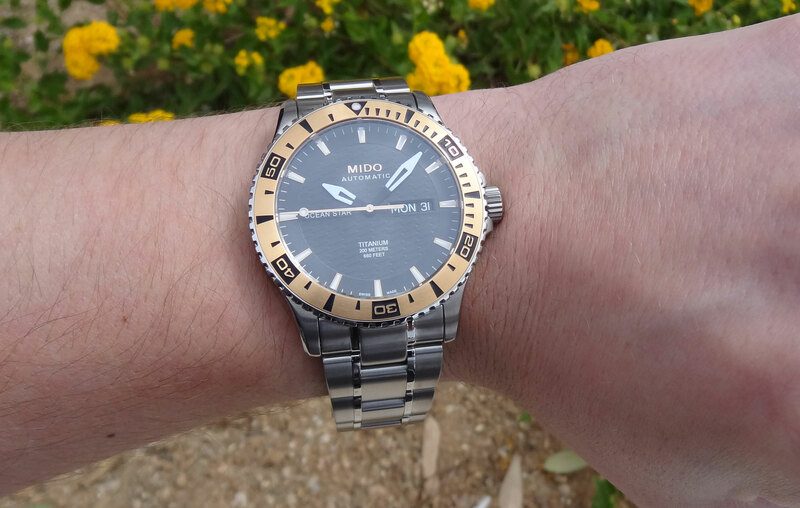 The Mido Great Wall series are also all COSC (or Certified Chronometer) movements. Each utilize an ETA 2836-2 movement, beautifully decorated and guaranteed to perform with in -4/+6 seconds a day deviation rate. 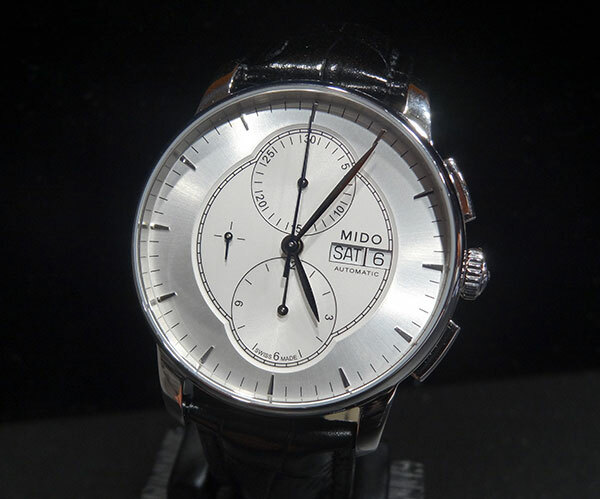 Many may not realize that Mido is actually one of the top 10 producers of Certified Chronometer pieces in the Swiss watch industry. Last I heard, they were actually ranked at number 6. Very impressive for such a boutique brand. 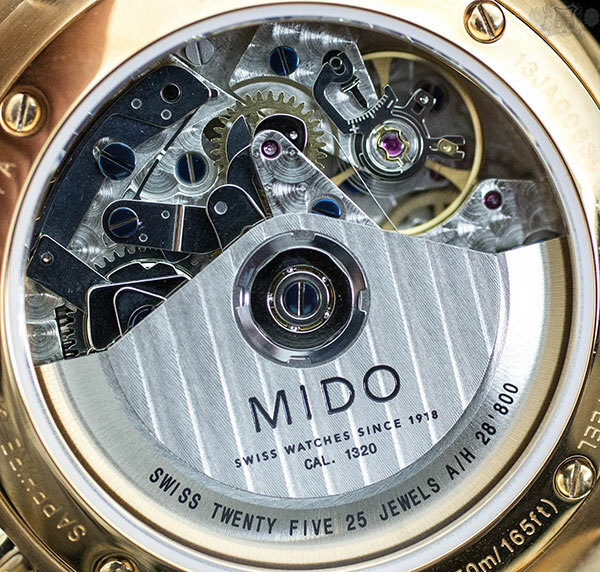 As most already know, Mido is an incredible value for a Swiss ETA movement by itself, but for Certified Chronometers, it is outstanding. This piece retails for only $1,490 which is an incredible price for a piece of this quality. 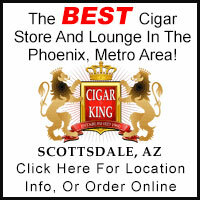 Mido is gaining a tremendous following not only in China, but here in the US and especially here at AZ Fine Time. 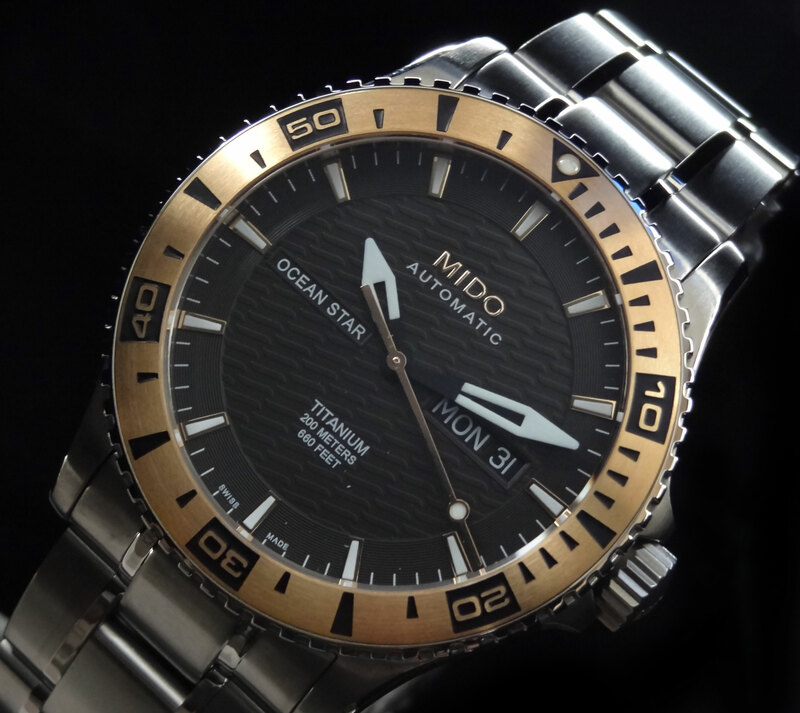 As always, if you have any questions about Mido, feel free to give us a call at 1-800-486-3996. 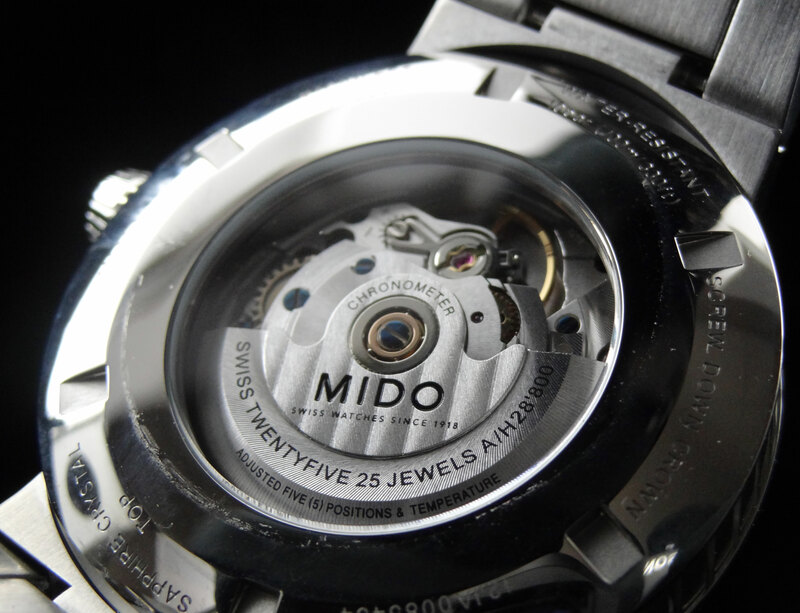 As most of you know, Mido is an incredible value brand. 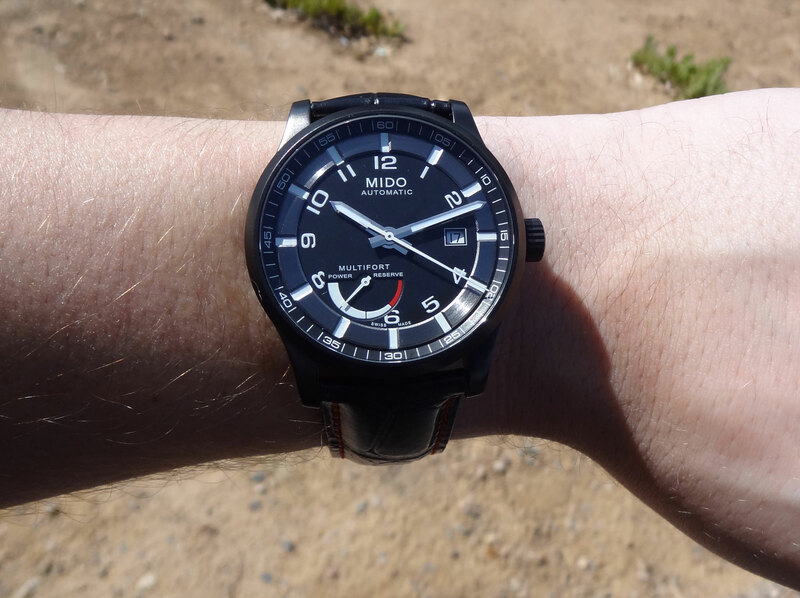 It’s really difficult to find a watch that compares in quality near the same price point. The Ocean Star Captain IV, probably our 2nd best selling after the Multifort series, has gained an incredible following over the last few years and it’s easy to see why. The build is excellent, the movement is a workhorse, and the price is tough to beat in a 200m dive watch. 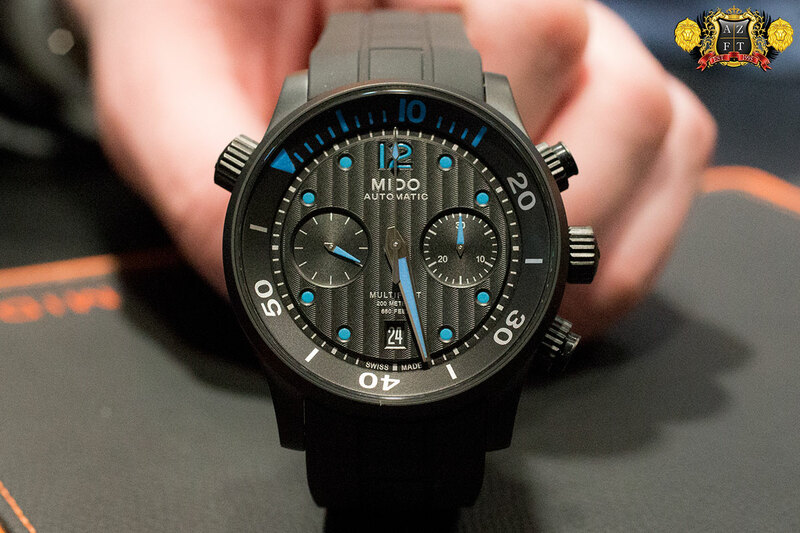 This year at the Basel Fair, Mido introduced a new series of Titanium OSC IV’s, and the 1st to deliver is the Mido Ocean Star Captain IV Titanium M011.430.54.061.02. The Ocean Star started out in 1959. It was a unique case design that was one solid piece construction and could only be entered by removing the crystal. This piece also introduced the Aquadura stem and crown sealing system, that basically was a cork insert to prevent water from entering the case through the crown, which is still used today. The weird thing about the original Ocean Star is that now, the design is now called the Commander, and the Ocean Star series has a totally new dive inspired design. 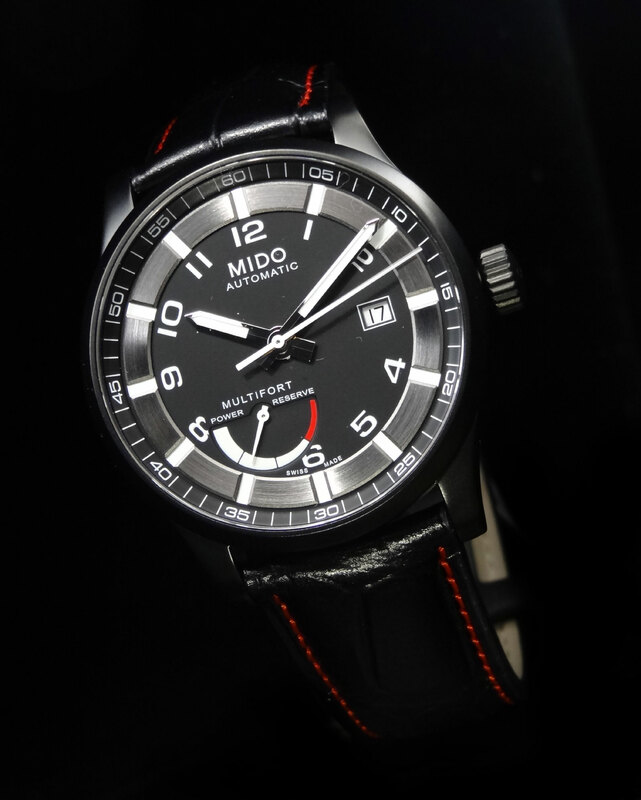 The Mido Ocean Star Captain IV Titanium M011.430.54.061.02 is all titanium case and bracelet. The uni-direction 60 min bezel is also Titanium, with a rose gold plating that is slightly dulled by the titanium. 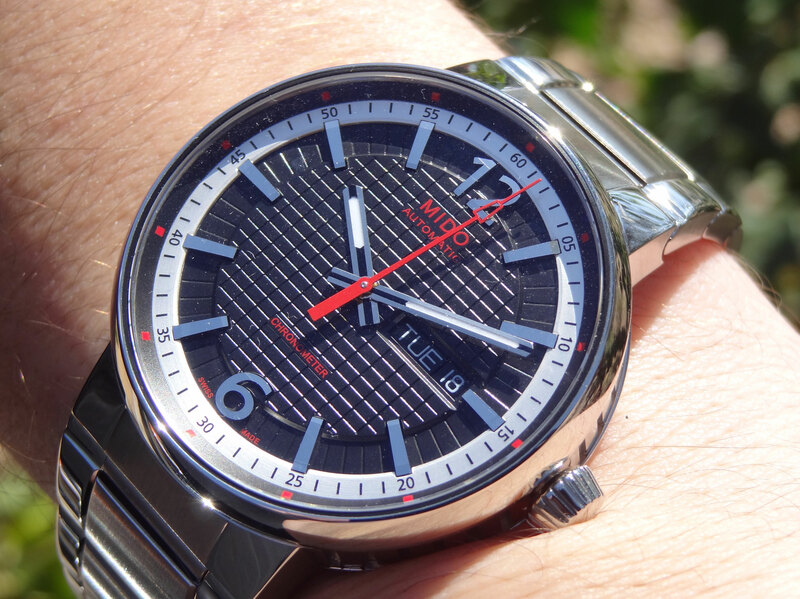 The combination looks very impressive and gives much character to a fairly simple watch. Also adding to it’s character, the bracelet is a combination of brushed and polished finish, which is quite unique to find on titanium. 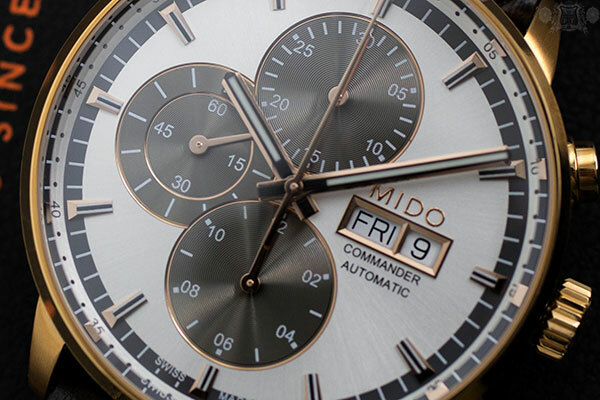 The black wave pattern dial is very simple and clean with rose gold accents on the Mido logo as well as all the indexes and second hand. 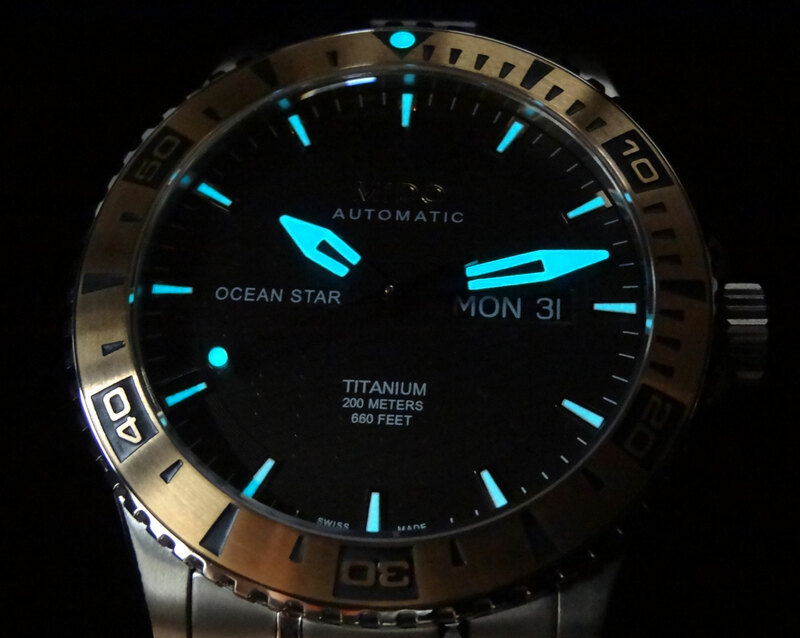 The luminescence glows a bright blue for clear legibility at night. 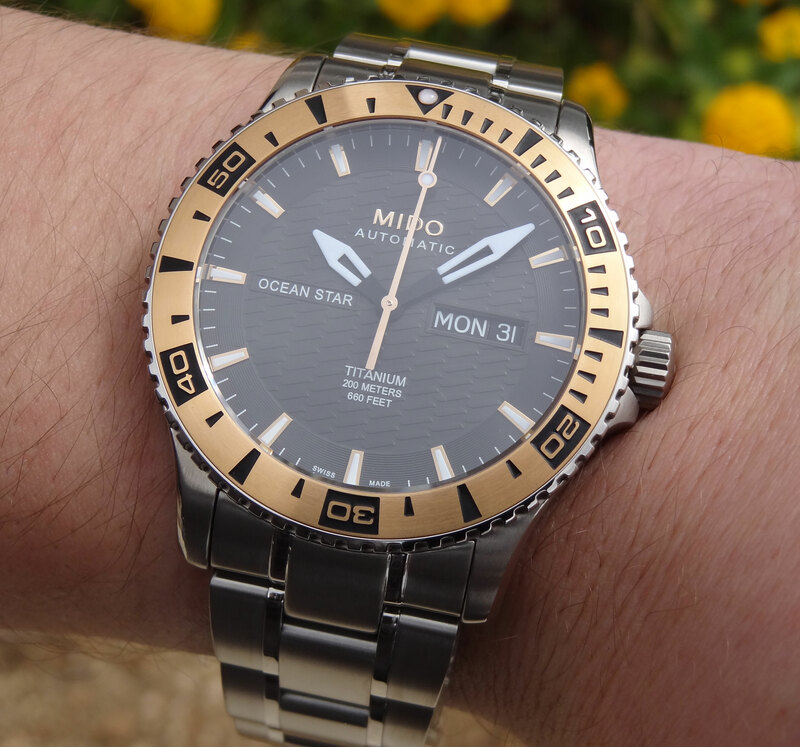 The dial is actually pretty wide considering the diver bezel. The case itself is 43.5mm wide, 11.43mm thick and weighs in at a mere 121.7g. The nice size combined with the light weight of the Titanium makes for a very comfortable wear. 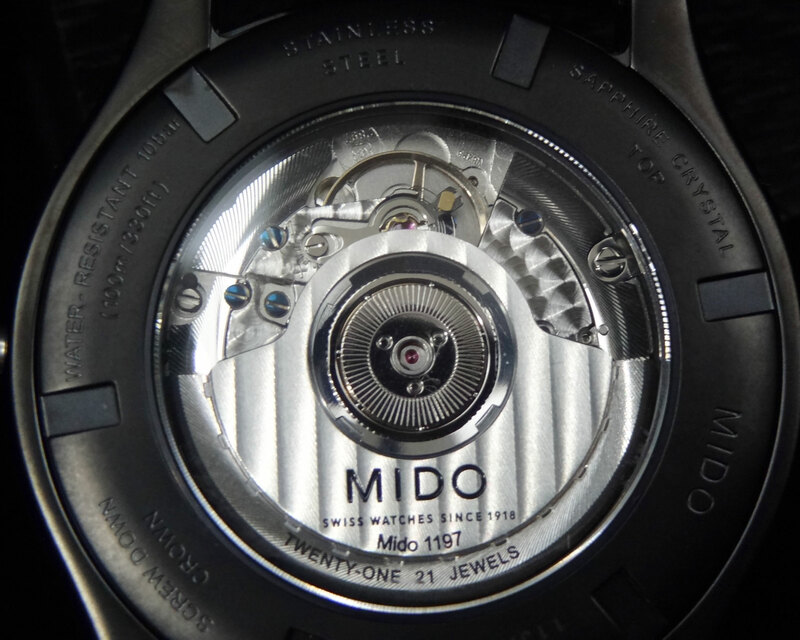 Mido utilizes the ETA 2836-2 movement with a very nice polish and Geneva striping on the rotor. The movement is your basic 3 hand with both day and date feature. There is mineral crystal to expose the nicely done movement on the case back, and there is sapphire crystal on the front protecting the dial. The overall build on this piece is very impressive, especially for the price. 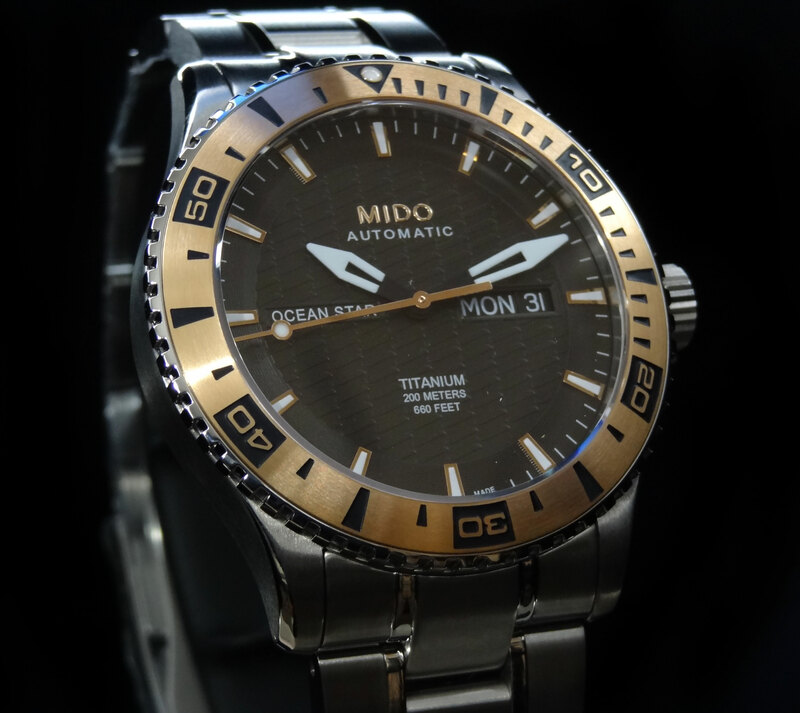 Retail on the Mido Ocean Star Captain IV Titanium M011.430.54.061.02 is $1,180, and continues to prove the point that Mido is an outstanding value. 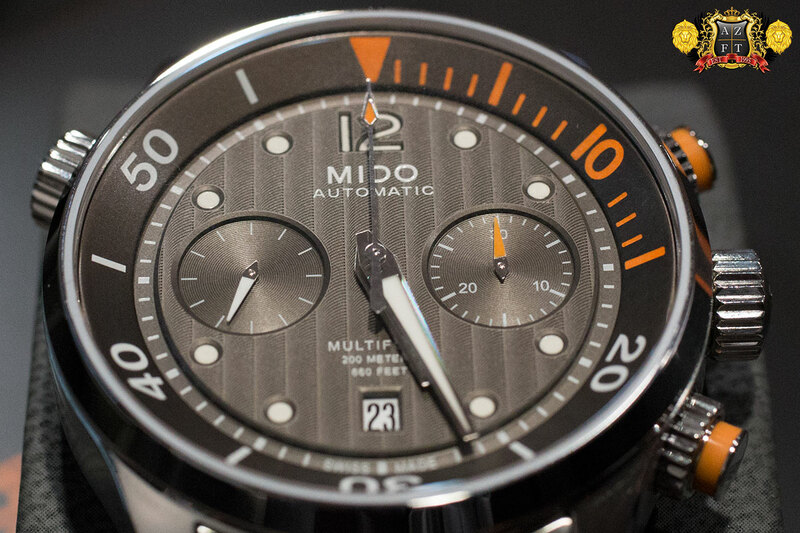 This wonderful addition to the Mido lineup just delivered to AZ Fine Time and is now available for order. 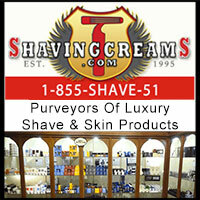 If you have any questions, please feel free to call us at 1-800-486-3996.